The Housing Chronicles Blog: L.A. Times book review of "Who's Your City?" 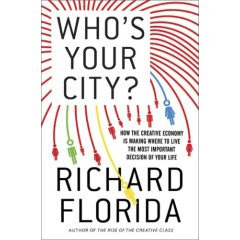 My book review of Richard Florida's latest work "Who's Your City? How the Creative Economy is Making Where to Live the Most Important Decision of Your Life" is currently online at the L.A. Times website and also available in print in the Sunday, April 13th edition. Florida, who rose to prominence with his best-seller "The Rise of the Creative Class," translates his ideas on how cities attract the types of open-minded innovators who start companies and develop unique communities into a roadmap for individuals to decide whether they should stay in place, move to a different neighborhood or even an entirely different region of the U.S. -- or world. Although Florida doesn't currently have any clients who are developers or homebuilders, we're hoping at MetroIntelligence to find a way to work with his company, The Creative Class Group, to bring his ideas and data to our own clients so they can develop communities that are as distinct as the buyers to whom they market. More on that later. Looking for a quick and easy way to determine your own priorities in a neighborhood? Then be sure to check out www.whosyourcity.com.